Malaysian and Australian leaders sought to inject new momentum into the search for Malaysia Airlines Flight 370 as chances dim for finding the flight recorders before their locator beacons run out of power. As the chances dim for finding Malaysia Airlines Flight 370′s “black box” flight recorders before the batteries in their locator beacons run out, Malaysian and Australian leaders sought to inject new momentum into a search of the southern Indian Ocean that has yet to find plane wreckage. 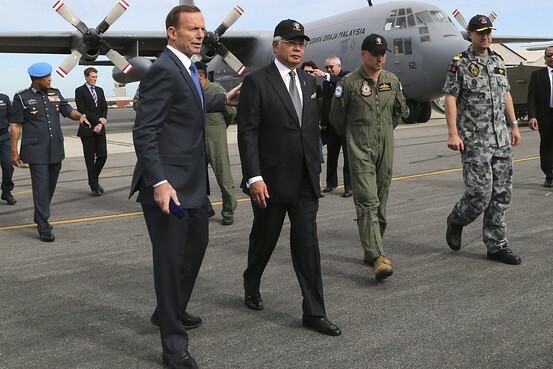 Malaysian Prime Minister Najib Razak met aircrews involved in the multinational search for Flight 370 at Pearce air base, near Perth, on Thursday. The visit is Mr. Najib’s first to Australia since the focus of the search swung abruptly to the southern Indian Ocean on March 20, based on satellite images of possible plane debris. So far, nothing related to the missing plane has been found. The hundreds of men and women involved in the search for missing Malaysia Airlines flight MH370 were today recognised for their efforts by the Prime Minister of Malaysia, Najib Razak, and Australian Prime Minister Tony Abbott. They spoke to personnel at RAAF Base Pearce, the hub of the aerial search, where they honoured the efforts of the eight nations involved. “It was a very heart-warming experience to be introduced to the leaders of the various countries—from China, from the United States, from New Zealand, from Japan, from the Republic of Korea, from New Zealand and of course from both Australia and Malaysia,” Prime Minister Najib said. Prime Minister Najib also announced that Australia had accepted its invitation to participate as an accredited representative in the investigation and would continue to work closely together to draw up a comprehensive agreement on the search. The search area is being continually adjusted and today it moved north. At the end of the day, ten aircraft and 9 ships were involved in search activities. Three aircraft searched in the southern search area of 248,000 square kilometres, 1700km west north west of Perth. The Royal Navy hydrographic ship HMS Echo also operated in the northern area searching for sonic transmissions from the flight data recorder. One alert was experienced but discounted. False alerts may be experienced from biological sources such as whales or interference from shipping noise. There have been no sightings of any objects reported today (as at 1930 AEDT). Weather in the search area was fair, with visibility approximately 10 kilometres. Perth, Australia (CNN) -- Two ships central to the hunt for missing Malaysia Airlines Flight 370 are due to arrive in the search area in the coming hours amid hope that a new clue to the plane's whereabouts may be imminent. A British Royal Navy survey ship, HMS Echo, will be conducting a specific search on Friday, a spokesperson for the Australian Defence Force told CNN. The Ocean Shield, an Australian naval vessel equipped with special U.S. technology designed to detect the pings from the flight recorders, is also due to arrive in the search area overnight Thursday. The spokesperson, who is not authorized to speak to the media, told CNN there would be a "big" operations news conference on Friday by retired Air Chief Marshal Angus Houston, the head of the Australia's new Joint Agency Coordination Centre, who has been tasked with overseeing the search effort. It's not yet clear what the news conference will cover, but any progress will likely be welcomed by the despairing relatives of the 239 people aboard the plane, which vanished nearly four weeks ago. Up to 10 military planes, four civil jets and nine ships will assist in today's search for missing Malaysia Airlines flight MH370. The first aircraft will depart for the search area at 6am Western Standard Time (WST). A total of 26 State Emergency Service (SES) volunteers from Western Australia, New South Wales and Victoria will work as air observers on three of the civil aircraft. The other civil aircraft will operate as a communications relay. The weather forecast for today's search is fair, with visibility approximately 10 kilometres and a cloud base between 1000 and 2000 feet. SYDNEY—Australia began an underwater search of the southern Indian Ocean for Malaysia Airlines Flight 370 using military hardware from U.S. and U.K. Navies, despite repeated air sorties that have so far failed to find any wreckage from the missing plane. Air Chief Marshal Angus Houston, who is coordinating the multinational search off the coast of Australia, said the Australian defense vessel Ocean Shield and HMS Echo would cover a 240 kilometer area of ocean where authorities think the plane is most likely to have gone down. Ocean Shield is equipped with a U.S. device designed to detect signals from the aircraft’s black box flight recorders deep below the ocean surface. HMS Echo is a U.K. military survey vessel able to profile ocean depths. The former Australian defense chief said investigators were reaching the end of their analysis of radar data and satellite communications from the plane. “I think we have probably got to the end of the process of analysis. My expectation is we’re into a situation where the data we’ve got is the data we’ve got, and we’ll proceed on the basis of that,” he said. Almost two dozen planes and ships trawled 135,000 square miles of ocean Friday trying to find the black box of missing Malaysia Airlines Flight 370. The Australian navy ship Ocean Shield was towing a U.S.-supplied "pinger locator" that can scan beneath the surface for whatever faint signals the jet's battery-powered data recorder might still be sending almost a month after it disappeared with 239 people on board. Australia's Joint Agency Coordination Center said one possible alert was picked up, but it was soon "discounted." "False alerts may be experienced from biological sources such as whales or interference from shipping noise," it said. Eight other ships, 10 military planes and four civil jets were taking part in Friday's search, which covers essentially the same area that was searched Thursday, Australian Air Chief Marshal Angus Houston told reporters Friday. It's about 1,050 miles north of the western Australian port of Perth. The Royal Navy survey ship HMS Echo and the Australian naval supply ship Ocean Shield have begun an underwater search for wreckage as time is running out for the batteries powering the beacons on the plane's flight recorders. The two ships are using advanced equipment to search a single 240-kilometer track, said retired Air Chief Marshal Angus Houston, the head of the joint coordination center. The Ocean Shield is equipped with the TPL-25, a giant underwater microphone that will listen for the pings from the flight data recorders and the Bluefin-21, an underwater robot that can scour the ocean bed, looking for signs of wreckage. But until searchers can find a confirmed piece of debris from the plane, which would give them a clearer idea of where the main wreckage might be located, there is no certainty the sophisticated listening technology is being directed in the right area. "Really the best we can do right now is put these assets in the best location -- the best guess we have -- and kind of let them go," U.S. Navy Cmdr. William Marks told CNN. "Until we get conclusive evidence of debris, it is just a guess." The Royal Australian Navy and Royal Navy have today commenced a sub-surface search for emissions from the black-box pinger from Malaysia Airlines flight MH370. Using the Towed Pinger Locator (TPL) from the United States Navy on Australian Defence Vessel Ocean Shield and a similar capability on HMS Echo, the two ships will search a single 240 kilometre track, converging on each other. This will be the first time that a sub-surface search will have been conducted in the search, in an attempt to detect the signal from the black-box of MH370. The Commander of Joint Task Force 658, Commodore Peter Leavy, said the two ships and their towed-pinger equipment would be operating at significantly reduced speed to search at depths of three thousand metres or more. “There has not been any change in the search,” Commodore Leavy said. “No hard evidence has been found to date so we have made the decision to search a sub-surface area on which the analysis has predicted MH370 is likely to have flown. “While the preference for search operations is to use physical evidence and then drift modelling to determine a smaller sub-surface search area, the search track is considered to be the best estimate possible for an area likely to contain the crashed aircraft. “The equipment on Australian Defence Vessel (ADV) Ocean Shield and HMS Echo can only operate effectively at reduced speed, around three knots. Functionality tests were carried out on the TPL, Autonomous Underwater Vehicle (AUV) and transducer pole to prove its effectiveness during transit to the search area. All the acoustic sensors, GPS positioning, tracking and frequency systems and positioning of the equipment completed a functionality test. 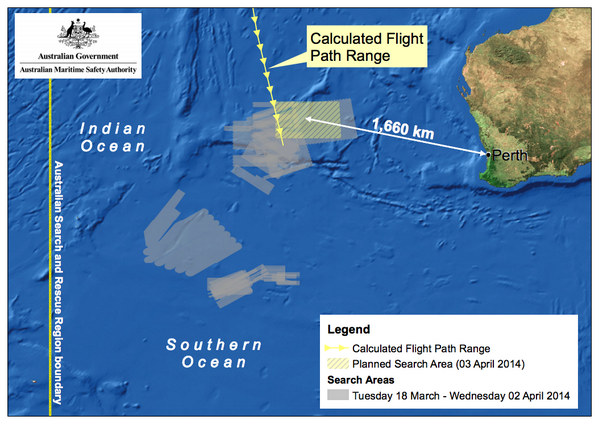 Today there have been some sightings of objects reported by ships in the search area but none were associated with MH370 (as at 1900 AEDT). The Royal Australian Navy, using the Towed Pinger Locator from the United States Navy on Australian Defence Vessel Ocean Shield, and the Royal Navy, with a similar capability on HMS Echo, today began the underwater search for emissions from the black-box pinger from Malaysia Airlines flight MH370. A total of 14 aircraft and 11 ships were involved in today's search activities. The Australian Maritime Safety Authority determined a search area of about 217,000 square kilometres, 1700 kilometres North West of Perth. Weather in the search area was good, with visibility greater than 10 kilometres. Relatives of Chinese passengers aboard the missing Malaysia Airlines flight should return home to start the recovery process, mental health experts say. Such a prolonged period disconnected from friends and family was having an adverse effect on their well-being and keeping them locked in the early stages of the grieving process, the experts said. Families of many of the 239 people on board the flight were taken to hotels in Beijing and Kuala Lumpur when news broke on March 8 that it had vanished. As the days passed and leads dried up, many - particularly some of the Chinese - became frustrated and vented their anger towards officials and journalists. Public sympathy has started to wane, leading the Chinese government to distance itself from their comments and accusations. Paul Yin, a psychologist volunteering at the Lido Hotel in Beijing, said grouping families together had helped in co-ordinating the operation but it was time for them to go home, where he hoped the authorities would ensure they were properly cared for. Sean Lee, a counsellor who has provided help for some 10 Malaysian families in Kuala Lumpur, said their response had been more muted. When Prime Minister Najib Razak announced the flight had "ended" over the Indian Ocean, he said, the Malaysian reaction had "not been as strong as expected". That was a sign they had overcome the disbelief characteristic of the initial stages of trauma, he added, and pointed to the Malaysians' strong religious beliefs as a possible reason. "Religion helps people to face a situation where they feel powerless to change anything. They will leave everything to God," he said. "[For the Chinese], demanding the truth is something they believe they can do for their family members." China's tomb day: With no body, how to mourn? Posted: Friday, April 4, 2014 1:26 am | Updated: 5:05 am, Fri Apr 4, 2014. ZIWEI VILLAGE, China (AP) — The Li family wonders how to spend Saturday's annual Tomb-Sweeping Day. The three Li brothers usually visit their mother's grave in their rugged village in northeast China, but absent this year is the youngest brother — a passenger aboard the missing Malaysian airliner. Should they add 34-year-old Li Zhixin to those they should mourn? If so, how would they do that without a grave? And what if he is still alive? Their state of limbo reflects one of the emotional struggles for the families of Chinese passengers aboard Malaysia Airlines Flight 370. The culture places a strong emphasis on recovering the body of a dead person before closure can properly begin. On Tomb-Sweeping Day, families typically visit the ancestral burial plot to clean the graves and present offerings of fruit and burn paper money. Some set off firecrackers for good luck and to drive off evil spirits. Such traditions are strong in rural areas, though they are falling by the wayside as people migrate to the cities. The Chinese believe the body to be the carrier of one's soul, said Han Gaonian, a folklorist at Lanzhou-based Northwest Normal University. "If you have the body, then the soul has a place to be," he said. Those presumed dead and whose bodies cannot be returned usually get a grave with their clothes buried, Han said. But there is no ritual of mourning for those whose fates are unknown. "People still hope they may return alive," Han said, referring to the passengers on Flight 370. "And in some rural areas, families may hold some ritual of calling back the soul of the missing, alive or dead." The father and eldest son, Li Jingxin, traveled to Beijing the day after the plane went missing. But they were frustrated by the lack of information provided by airline officials, and the father returned home a few days later. "Pigs cherish their piglets, dogs cherish their puppies, and we humans cherish our children," he said. "There has not been a day that I do not miss my child." (CNN) -- Four weeks to the day since Malaysia Airlines Flight 370 went missing, the trawling for clues goes on. The search for physical evidence continues Saturday -- both on the surface of the southern Indian Ocean and deep below it. The search for digital clues on the hard drives of a flight simulator in the home of one of the pilots turned up nothing conclusive. There was no "we got it" information, a U.S. official with knowledge of the investigation told CNN late Friday. There were some "curious" things, given the situation, the official said. The captain, Zaharie Ahmad Shah, had programmed several alternate routes into the simulator, but it appeared he had done so to come up with safe plans of action in case of emergencies aboard the plane, the official said. The searches appear to be what an experienced and professional pilot would do, the official said. Up to 10 military planes and three civilian aircraft -- in addition to 11 ships -- will be looking Saturday for any sign of Flight 370, according to the Australian government. The search area will be just under 84,000 square miles (217,000 square kilometers), which is slightly less than the area searched Friday, and will focus some 1,050 miles northwest of Perth. This is about 50 miles further from the western Australian city than was the case a day earlier. The Chief Coordinator of the Joint Agency Coordination Centre, Air Chief Marshal Angus Houston (Ret'd), said reports that the Chinese ship, Haixun 01, had detected electronic pulse signals in the Indian Ocean related to MH370 could not be verified at this point in time. “I have been advised that a series of sounds have been detected by a Chinese ship in the search area. The characteristics reported are consistent with the aircraft black box. A number of white objects were also sighted on the surface about 90 kilometres from the detection area. However, there is no confirmation at this stage that the signals and the objects are related to the missing aircraft,“ Air Chief Marshal Houston (Ret'd) said. “Advice tonight from the Australian Maritime Safety Authority's Rescue Coordination Centre (RCC) and the Australian Transport Safety Bureau is that they cannot verify any connection to the missing aircraft. “The RCC in Australia has spoken to the RCC in China and asked for any further information that may be relevant. “The deployment of RAAF assets to the area where the Chinese ship detected the sounds is being considered. I think that something was mentioned on the radio that they heard it again and managed to record it. Waiting for confirmation. A Chinese ship searching for the missing Malaysia Airlines plane in the southern Indian Ocean has picked up a pulse signal, Chinese media say. They say the signal has a frequency of 37.5kHz - the same as those emitted by the flight recorders. However there is no evidence so far that it is linked to MH370. Dozens of ships and planes have joined the search, with the operation moving into its most intensive phase before batteries on the data recorders fade. On Saturday the Haixun 01 - one of two Chinese ships in the area - picked up the signal at about 25 degrees south latitude and 101 degrees east longitude, the state-run Xinhua news agency said. "It is yet to be established whether it is related to the missing jet," it cautioned. China's Liberation Daily reported that three people on board had heard the signals, which were not recorded as they came suddenly. PERTH, Australia—A Chinese vessel searching for signs of missing Malaysia Airlines 3786.KU 0.00% Flight 370 detected an unidentified pulse signal on Saturday in the southern Indian Ocean, according to China's state-controlled news agency. Australian Defence Minister David Johnston said he was optimistic about the report. But he and other Australian and Chinese officials cautioned that there was no proof the signal is related to the jetliner, which authorities believe crashed into the ocean on March 8 with 239 people on board. Earlier reports of potential signs of the plane, such as debris spotted floating in the ocean, have turned out to be false. A Chinese vessel equipped with a so-called black-box detector on Saturday picked up a pulse signal in the designated search area of the southern Indian Ocean, according to the official Xinhua News Agency. Xinhua said China's Haixun 01 patrol ship "discovered a pulse signal" with a frequency of 37.5 kilohertz at around 25 degrees south latitude and 101 degrees east longitude. A potential new clue to the whereabouts of missing Malaysia Airlines Flight 370 emerged Saturday, with a Chinese patrol ship detecting a pulse signal coming from the search area, according to reports from China's official news agency, Xinhua. A "black box detector" deployed by Chinese ship Haixun 01 "detected a pulse signal" in southern Indian Ocean waters, Xinhua said late Saturday local time. The signal was picked up around 25 degrees south latitude and 101 degrees east longitude. Also on Saturday, Xinhua reported a Chinese air force plane spotted a number of white floating objects in the search area, which is northwest of the Australian city of Perth. The Australian government agency coordinating the search said that those reports, as well as any connection between the pings and the missing plane, could not be immediately verified. "I have been advised that a series of sounds have been detected by a Chinese ship in the search area. The characteristics reported are consistent with the aircraft black box," said Air Chief Marshal Angus Houston, the chief coordinator of the Joint Agency Coordination Centre, in an e-mailed statement. "A number of white objects were also sighted on the surface about 90 kilometers (56 miles) from the detection area. However, there is no confirmation at this stage that the signals and the objects are related to the missing aircraft." Page created in 10.371 seconds with 20 queries.